Upon arrival at a location to be sampled, designate and record station number, date, time and GPS readings on the Field Observation Form. Describe sample location and sample species on the Field Observation Form. Take photographs of area sampled. Record water temperature on the Field Observation Form. Harvest the fin fish sample. Collect three samples of each fin fish species at each location. If the fin fish sample is small, it may take two to three fish to provide sufficient tissue for each sample. The three samples of each fin fish species at each location should be comprised of fish of approximately the same size. Wear a clean set of Nitrile gloves when preparing each sample. Change gloves between each of the three samples and locations. Place the fin fish on a layer of aluminum foil. Take photos of the fin fish on the foil layer. Place the fin fish fillet sample on a layer of aluminum foil. Approximately a pound of fillet is required for a sample. Take photos of the fin fish fillets on the foil. Fold the aluminum foil around the sample. Wrap the sample with an additional two layers of aluminum foil. Label the outer foil layer and transfer into a Zip Lock bag. The label should contain information on the date and time sample was collected, species, location the species was collected, and tissue type (fillet). Remember to collect three fillet samples for each species from each location. Put on a new set of Nitrile gloves. Cut off the head of each fin fish that the fillet was collected from. Be sure the head still has the eyes attached. Place the head samples on a layer of aluminum foil. Take photos of the heads of the fin fish on the foil. Fold the aluminum foil around the head sample. Wrap the sample with an additional two layers of aluminum foil. Label the outer foil layer and transfer into a Zip Lock bag. The label should contain information on the date and time sample was collected, species, location the species was collected, and tissue type (head with eyes). Remember to collect three head samples for each species from each location. 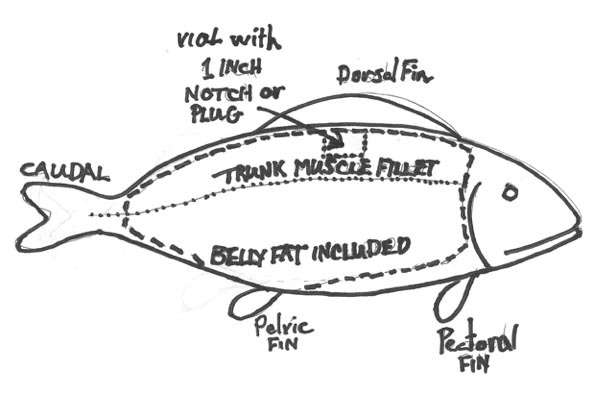 Obtain a dorsal plug of muscle from each fish specimen. Place the dorsal plug in a specially provided container (vial). Label the container with the date and time sample was collected, species, location the species was collected, and tissue type (dorsal plug). Put on a new set of Nitrile gloves. Remove the liver and kidneys from each of the fin fish specimens. Place the organs on separate aluminum foil layers. Take photos of the organs. Fold the aluminum foil around each organ sample. Wrap each organ sample with an additional two layers of aluminum foil. Label the outer foil layer and transfer into a Zip Lock bag. The label should contain information on the date and time sample was collected, species, location the species was collected, and tissue type (liver, kidneys). Fill out the Chain of Custody form for the tissue samples collected. Place the sample on ice and store at 4C. After completion of the sampling event take photographs of the area that has been sampled and photographs in all four directions from the sampling location. Describe the general area and the specific area sampled on the field observation form. Note the type of samples collected at the location. Place all waste, used aluminum foil, Nitrile gloves and paper towels in a garbage bag. Place used utensils in a separate garbage bag in a safe manner to avoid injury. Place used fillet knives and cutting knives in a container before placing the container in the garbage bag. Sample each station following the procedure detailed above. At the end of the sampling effort, double wrap all samples to be contained in one ice chest in two large garbage bags. Return the samples to the ice chest and pack the ice chest with ice. Compete filling out the Chain of Custody form with information on the name of the sampler. When the sampling event is completed, freeze the samples in a secure freezer or in dry ice until shipment to the laboratories or collected by staff from UTMB.